Emergency serices have treated at least 38 people for various injuries which were sustained during riots between protesters and riot police, the Catalan government reported on Twitter. The government called the injuries “the result of the repression by the Spanish police”. Witnesses report Spanish riot police has fired rubber bullets at people partaking in the Catalan referendum on independence. Several people claimed they were injured by the rubber balls fired by the police. Catalan regional president Carles Piedgement, one of the main proponents of the controversial referendum, has strongly condemned the use of any kind of violence. Piedgement said the “injustifiable violence” creates a terrible image of Spain. Jordi Turull, spokesman for Catalonia’s government, has said that 73 percent of about 6,000 polling stations are open despite a crackdown by police to try to halt the referendum. Turull called for Catalans to remain calm and patient but to defend “in a civic and peaceful manner” their right to vote after riot police blocked voting in some polling centers and confiscated ballot boxes amid clashes with protesting voters. Several members of the Catalan regional government have cast their ballots in the banned referendum on independence. Catalan regional president Carles Puigdemont had to divert to Cornella de Terri, near the northern city of Girona, after police took over control of the original polling station where he planned to vote. Puigdemont is one of the key separatist politicians who has pushed to go ahead with the vote despite the Constitutional Court banning the referendum. Spanish media report that regional vice president Oriol Junqueras also had to go to a different polling location after police took control of the station where he originally planned to cast his vote. A Catalan voter told Al Jazeera, “We want our country free. They are gone!” refering to the Spanish government. A polling station in the Sant Julia de Ramis sports centre near the city of Girona has become the scene of riots as Catalan protesters clashed with police. Protesters shouting, “We will vote” and “Get out” marched towards the riot police. Police officers forced their way into the voting centre using lock cutters and a hammer to gain access to the building where Catalan president Carles Puigdemont was scheduled to vote this morning. 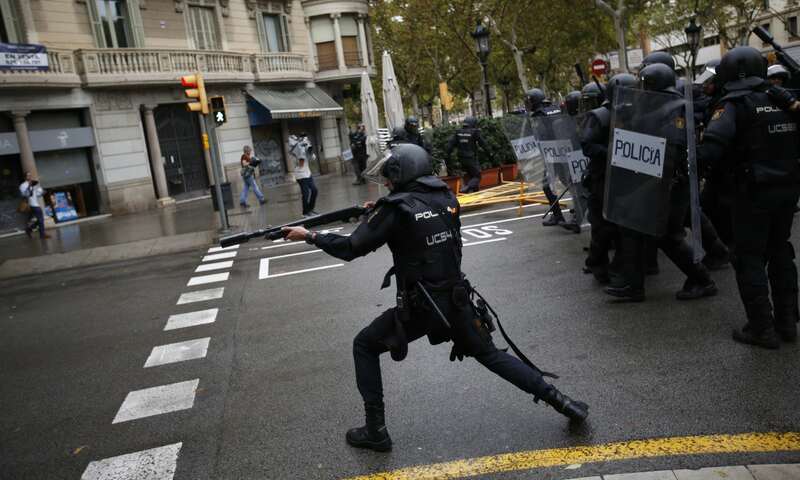 Spanish riot police clashed with Catalans voters in Barcelona who want to cast their ballot in the referendum. Polls have opened in the highly controversial referendum on Catalonia splitting from Spain. Thousands of Catalans are expected to cast their ballots in the referendum, which will have no legal status as it has been blocked by Spain’s Constitutional Court and Madrid for being at odds with the 1978 constitution. Catalans were defying rain and police orders to leave designated polling booths as the referendum got under way on the region’s secession that has challenged Spain’s political and institutional order. The central government in Madrid had previously said 1,300 of 2,315 designated voting stations have been sealed off by police, who have been mobilised in the thousands in the region. Regional separatist leaders have pledged to hold the referendum despite the closure of the polling stations, which are most schools and other facilities. Police have been ordered not to use force but to empty schools where polling stations deemed illegal have been set up. Polling stations across Catalonia have opened their doors. Voters are to cast their ballots on whether the region should remain a part of Spain or secede. Madrid is poised to thwart the vote, which it considers illegal.